Our insurance clients deserve a trusted adviser who remains close to the industry, attends key conferences, and understands the emerging trends important to your company. As a client, you receive a dedicated, insurance-focused Project Manager who knows your company and your project, and takes personal ownership in driving growth and success for your organization. Very professional and knowledgeable staff. Always delivers quality service and products. 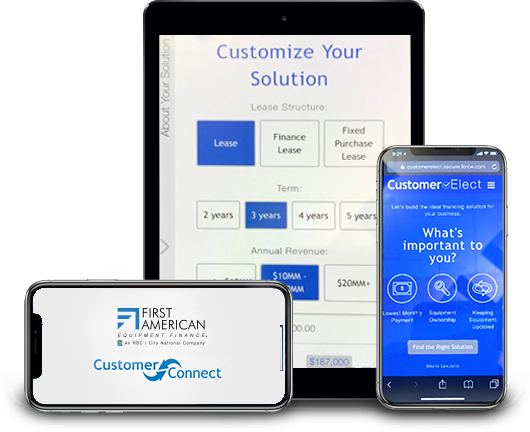 Why First American Equipment Finance? See why insurance companies across the country choose to work with us. At First American, we commit to doing whatever it takes to earn your loyalty. While other lenders may come and go, we have never wavered in our commitment to serving the unique equipment financing needs of the insurance industry. Need a custom solution for your unique needs? Your insurance finance specialist will collaborate with you to create an on-target solution to help you revolutionize your business. As a client, you receive a dedicated Project Manager who works with you to understand your needs and preferences as he or she provides you with personal, direct service. Your Project Manager takes personal ownership in driving growth and success for your organization.